On Monday March 27, 2017 at approximately 5:17 p.m., officers with Egg Harbor City Police Department witnessed a hand to hand drug transaction involving a suspect identified as Travis C. Wilson, 24 of Port Republic and an unknown. Officers attempted to stop Wilson, who fled in his vehicle. Wilson was found to have an outstanding warrant out of the Atlantic County Sheriff’s Department. 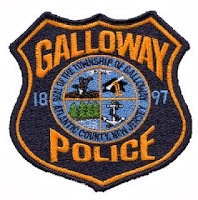 Wilson fled into Galloway Township where officers from Galloway Township Police Department engaged in the pursuit. Wilson eventually crashed his vehicle at the corner of Leipzig Ave and Cologne Ave where he then fled on foot. K-9 Sergeant Winneberger of Galloway Township Police Department conducted a K-9 track from the accident scene. Wilson was located and apprehended by Sergeant Winneberger and K-9 Rocky a short time later. Wilson was transported to ARMC Mainland and treated for his injuries. Wilson was charged with eluding/resisting arrest in Galloway Township along with several motor vehicle offenses. Wilson was charged with eluding/resisting arrest, hindering apprehension and several motor vehicle offenses in Egg Harbor City. Wilson was lodged in the Atlantic County Justice Facility.